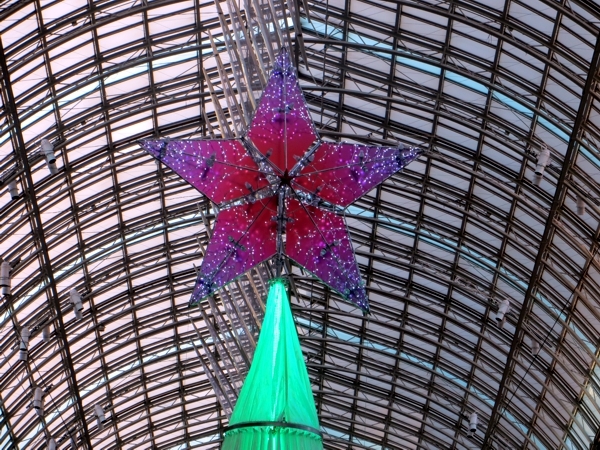 I know that artists designed the shiny star on the top of this glowing light-bright glass and metal 'tree' set up at the heart of the mall, and they may even have made it to boot, but the overall decorating emphasis is on shopping, not crafting. Unless you are shopping for craft kits, which I did notice in several stores. 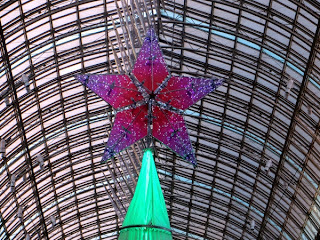 Nonetheless, I did a lot of gift knitting at the mall yesterday, because I had so many appointments scattered around its environs with breaks in between that I was not going to spend outside. So cold! 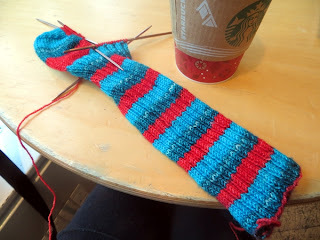 Here I am at the start of the day, long before the mall was even open, wondering whether an entire leg of SockZombie Sock ribbing really does go on forever. Apparently not, judging by progress made at my first coffee break. 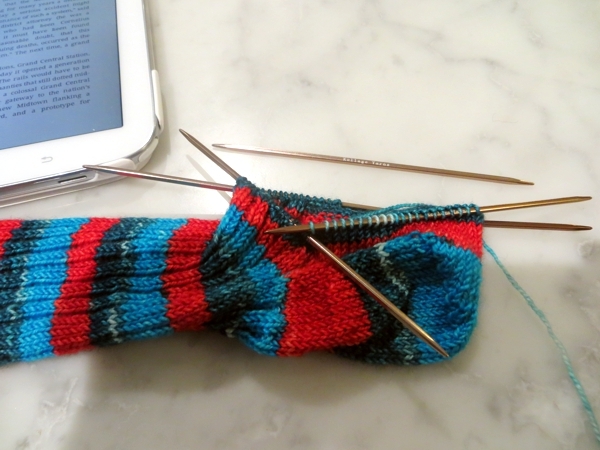 And with this heel, I have officially gotten four socks over the halfway marker with almost two weeks to spare. Yay! and also, YIKES. 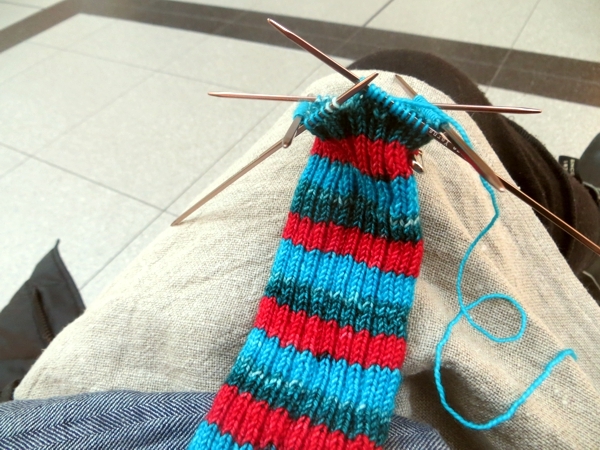 Well, one of the socks is actually complete except for the toe grafting, and two more are pretty close behind it. So maybe what I mean is yikes. Second coffee break! Not much farther along, not least because I was distracted by both reading and eating lunch during this particular knitting session. Yup, multitasking to the power of three! Truly the recourse of the desperate. Last night I cast on a new cowl and did part of a whole first round, then panicked looking over the first dry cowl and assessing its giftworthiness. The night before I put in about an hour's worth of scarf weaving, ditto the panic. Tonight I have canceled everything and hope to finish something, or at least wrap presents, or put away the Hallowe'en decorations so I can get at the Christmas ones. This decoration-storage situation always makes me wonder why I bother putting up decorations at all, yet I keep recreating the problem. Not quite as diligently as I recreate socks, and not nearly so productively, but still - I am clearly tenacious. Let's hope tenacity pays off in gift knits, shall we? Have a wonderful weekend while I keep my head down over the warm-things-in-progress, and I'll see you Monday. Beautiful sock and very long leg! Is the colorway Fire and Ice? I will finish my Fire and Ice socks today...so excited as I absolutely LOVE this colorway! Ohhh, that's my flowerpot hat lovenatto? That one was so much fun to make, and I always liked that non-ribbing brim too :^) Glad you found a way to adapt it for baby girls and congrats on your own, btw!